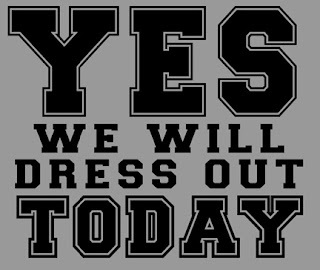 "I"M SORRY, LOUD AND PROUD"
"YES, WE WILL DRESS OUT TODAY"
The kids never learn, do they? Everyday they walk into the locker room and ask the same question, "Are we dressing out today coach?". What kind of a question is that? It almost makes you think like they don't want to be here or something. I don't get it.